I think it might have been a first. I have encountered birds on Twitter, and a squirrel from Banff. But on the weekend - on my birthday, in fact - I received what I believe to be my very first ever tweet from a tree. And not just any tree, but a dried up Christmas tree, one that has been abandoned on the new bridge since sometime in January when it slipped off someone's untarped load. It has been there for months now, and someone, somewhere, noticed it - and noticed it enough to begin a Twitter account for it. I was, I admit, immediately intrigued, and for several reasons. Of course I think it's absurd that this tree has been there for so long, and that no one has stopped to collect it. 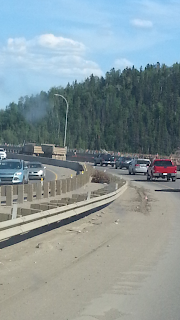 I wonder how many employees from every level of government responsible for roadways and garbage have driven by it. I wonder how many people actually still notice it. And that is why I wanted to get the tree off the bridge, but it opened another dialogue for me. How often do we start to become oblivious to the obvious? How often do we see something so often that we become blind to it, like a dried-up Christmas tree in June? When do we accept the normalcy of deviance? That term, "normalcy of deviance", was used after the space shuttle Challenger disaster. In essence it simply means that something that is not normal becomes so commonplace that we simply accept it. The deviant, or abnormal, becomes the normal. We become blind to it, like an abandoned Christmas tree we have driven by hundreds of times. Perhaps on occasion we notice it - like I did with that exact tree about three weeks ago - but then we drive on by, consumed by our own life and problems and thoughts, and once again the abnormal becomes forgotten, until it becomes the normal. We no longer see the problem, even when it looms in front of us like an elephant. And then, when it blows up, we are caught unaware because we have ceased to even see the issue that was there all along. The normalcy of deviance can be small, like an ignored and forgotten old brown Christmas tree on a bridge - or it can loom large. Sometimes I wonder if what happened in Germany before World War II was exactly this - a slow progression of deviancy, until suddenly concentration camps and yellow stars and neighbours disappearing in the night were the norm. And thinking about all that makes my head hurt, and my heart stop, because suddenly one can see how quickly the deviation can become the norm. But this is about an old, brown, dead Christmas tree on a bridge, right? Well, yes, and no. I want to see the tree get off the bridge - but I think this has ramifications in a broader sense. I think we need to look around our community to see what else we are not seeing, what else has become the norm when it should be the unusual. Perhaps it is homelessness, people living in tents in the middle of a region with such prosperity. Perhaps it is the high cost of housing, driven by a shortage of land. Perhaps it is the vacant Willow Square, waiting for an aging-in-place facility. Perhaps you can think of another issue that has been omnipresent but seems ignored. It seems a bit absurd, maybe, that a Christmas tree on a bridge can serve as a catalyst for all this, but that lone little tree in the middle of the median on the new bridge is a symbol of what happens when we stop seeing something because we become accustomed to it. It is an emblem for the kinds of issues we just accept when perhaps we should be talking about them, and working on them, and even demanding action. So, here is my request: please, someone, RMWB or Ministry of Transportation - get our lonely dead Christmas tree off the bridge. Let it move on to the next phase of life, but let it remind us of all the other things that we need to begin thinking about, the things we are no longer seeing because we drive by them every day. Let it remind us to open our eyes, and recognize how blind we can become to the obvious. I will be pleased when the tree is gone, and I will be gratified to know that one small Twitter account can effect change, even if it just means getting a tree off a bridge. I am also chastened, though, to realize it took one dead tree, and one Twitter account, and one person behind it, to make me see what I have been blind to for so long. Chastened - and grateful, because I am now opening my eyes after having had them closed for far too long, and once again seeing the deviances that have become the norm. 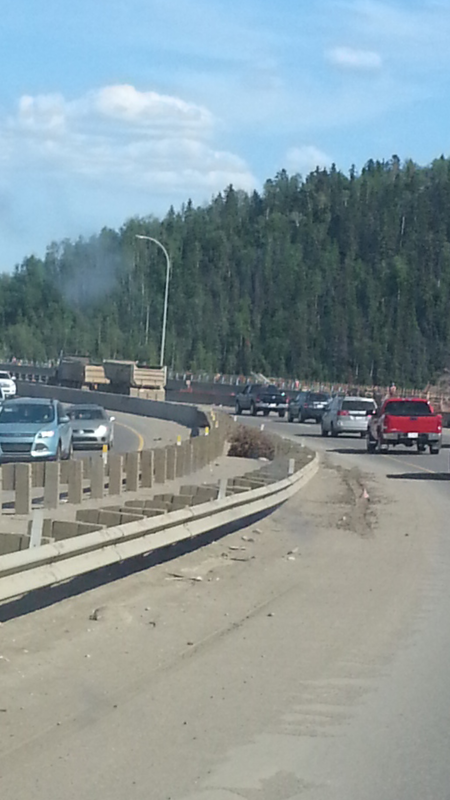 And all due to one dead, brown, lonely and forlorn Christmas tree on a bridge in Fort McMurray. But what happens to poor Mr Tree after he's removed. Your encouraging Tree murder! hehehe this is why you should always tarp your load... you don't want to have any mistakes popping up nine months later. Will the Real Fort McMurray Please Stand Up? A Cemetery in My Back Yard? Yes, Please.